Welcome at La Tulipe Orange. This is the adress, when you want a couple of days to relax. 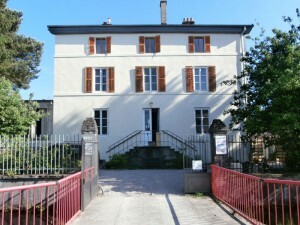 You are welcome at our beautiful “Maison de maitre” near the river Vologne. The house has his own bridge at the front and at the back. 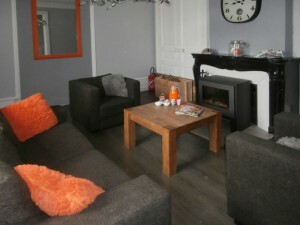 La Tulipe Orange is located in the centre of the quiet village Granges-sur-Vologne. The city Gerardmer is only a 10 minute drive away. The Vosges is an area with a beautiful nature: green acres, thousands lakes, rivers, forests and hills, which are above 1.000 meters. You can enjoy the Vosges throught out year. In the summer you can go hiking en cycling in de beautiful surroundings or when you desire more action, you can go to a amusement park. In the Vosges you can go motorcycling the various mountains, including the scenic route the Crêtes. The motors can be parked on our property. In the winter, there are ski-resorts in Gerardmer and in La Bresse. We have also in the lounge information on the sightseeing and activities for you. Each evening you can enjoy a delicious à la carte dinner in our cozy restaurant or a drink in the lounge infront of our fireplace. We will do everything possible to make your stay memorable.